One new thing we would like to see is supersymmetry. The two big multi-purpose detectors at the LHC, named ATLAS and CMS, have both done searches for SUSY in the new data and come up empty-handed. That doesn’t mean it’s not there, actually; a “search for SUSY” is typically a search for a particular kind of signal, often in a particular kind of model. There is so much data already that it’s takes time and more than a bit of ingenuity to search through it effectively. But we could have seen evidence by now, and we haven’t. Here is a paper from CMS, and a paper from ATLAS. 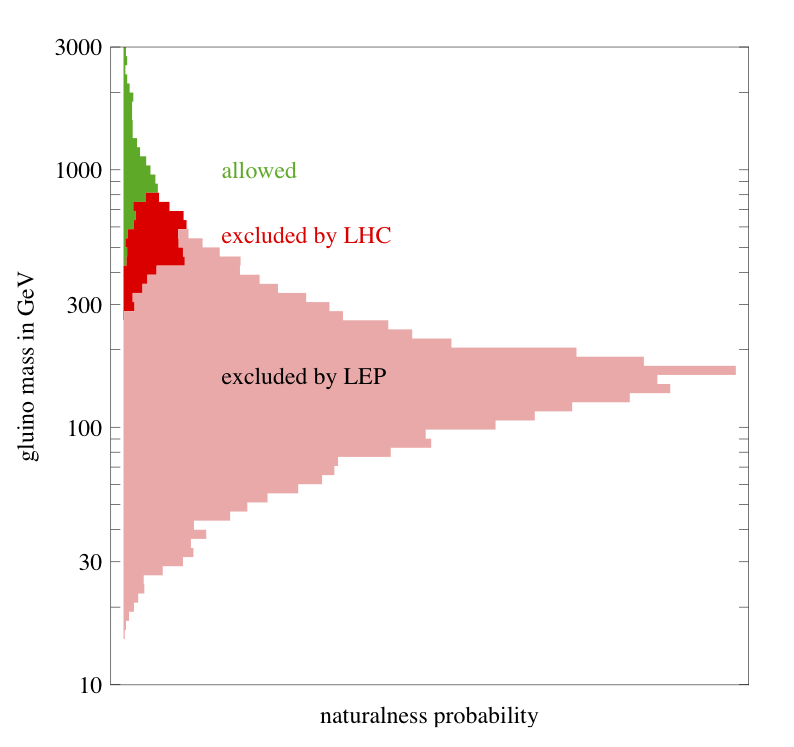 There’s also a great blog post describing the results by Flip Tanedo at US/LHC Blogs. If you like your exclusion plots a bit sassier, check out Résonaances, where Jester reproduces a plot from Alessandro Strumia. Here’s one way of thinking about the results, from the ATLAS paper (via Flip’s blog post). They look at collisions that produce a particular kind of signal — one lepton, jets (collimated collections of strongly-interacting particles produced by quark or gluon decay), and missing energy (indicating particles like neutrinos that aren’t measured by the experiment directly). Supersymmetry predicts lots of particles and lots of parameters, so you can’t realistically explore the whole parameter space and put it on a single plot. Instead, you fix some parameters and set others to zero, leaving a two-dimensional space of possibilities. In this case, the horizontal axis is a scalar mass parameter, and the vertical axis is a fermion mass parameter, in terms of which everything else is determined (within this highly constrained and frankly unrealistic parameterization). The solid-color regions are the places where previous experiments (the Tevatron and LEP) had already ruled them out. The dark black line is the new limit from CMS, and the dark red line is the new limit from ATLAS. Everything below those lines is ruled out. So: the LHC has ruled out a lot of parameter space that was previously allowed for supersymmetry. Which is too bad. Except that it’s very difficult to quantify what one means by “a lot” in this case. There are many different ways to parameterize the theories, and many different searches one can do. Nature could be surprising us; it wouldn’t be the first time. Bottom line: it’s too bad we haven’t found SUSY yet, but there’s certainly no reason to declare it dead. But supersymmetry might just be out of reach, or completely irrelevant. Theorists have to keep an open mind, and watch what happens as the experimenters push forward. My hope has always been that we’ll discover something that nobody thought of ahead of time — that possibility is very much open! Do you have any favored date for when we’ll see it (if we’ll see it)? It’d be fun to see leading physicists’ speculation on this. Nothing is irrelevent when it comes to science, Sean. Not even my theory on future waffles. It’s more predictive generally speaking then proven theory, but who knows, right? I find it a little disheartening that there is still no firm hints at SUSY. It seems like for both Relativity and GR (and even inflation), both *huge* leaps in theory for the time, had comparatively instant experimental verification. So it seems like nature is willing to verify revolutionary theories fairly quickly if they have merit and so again I am getting a little disheartened that so many years of searching for SUSY and still not so much as a firm hint. I’m starting to think we may need to go back to the drawing board. Not because I don’t like the theory but just because nature has historically usually been fairly kind to correct theories…. even if they are revolutionary. If it is so difficult to provide a measure on the landscape of supersymmetric theories, even in the well-defined experimental context of the L.H.C. (So: the LHC has ruled out a lot of parameter space that was previously allowed for supersymmetry. Which is too bad. Except that it’s very difficult to quantify what one means by “a lot” in this case. ) then how much more impossible is it to handle the landscape of superstring theory? Bottom line: it’s too bad we haven’t found SUSY yet, but there’s certainly no reason to declare it dead. Technically, correct. Emotionally, you’re disappointed, because given the SuperStrings theorist that you are, you REALLY wanted to see SOME indication of SUSY at this point, didn’t you? Not to worry. SST is VERY malleable, even if SUSY is not found at the LHC full luminosity and rated power, a GOOD SSTer will come up with a good MATHEMATICAL excuse as to why not. It has been predicted you will do this. Do not deny. SuperStrings <=== the Theory that will never die. Sean, I am willing to embrace SuperStrings and SUSY with all my heart and soul, IF you and yours can find proof, or the LHC can, and if so great, let them prove it, and if so we the SST skeptics will convert, in a heartbeat I hope. But things are not looking good, brah, they aren't. SOME of us have patience though, and we recognize that in TIME (a pet subject of yours) we'll know more. I'm patient, if others are not. We shall see. Until then, SuperStrings are on the Epicycles stack, at least where Epicycles were pre-Copernicus/Galileo. Although you have to admit, Epicycles was awesome Math. SST is too. Maybe even right. But even if it’s not right, PHYSically, it’s helped Mathematics itself, so it will never be a “total fail” as its strongest critics argue. Did anyone ever say the life of a theorist was easy? For your next trick, Sean? Explain “Langlands” to us, that incredible program to marry Algebra and Analysis. Witten likes it, and I’ve yet to see an assessable explanation of the same for the intelligent layman/woman. Supersymmetry has always bothered me. It always seemed rather contrived. I understand the math works but it still bothers me. If supersymmetry turns out to be wrong what alternative is there; RS1, ADD or something else? I’m hoping for something unknown. The REAL problem in all this is the identification of SUSY with CMSSM/mSUGRA…says who? If you give up this prejudice(!) then the SUSY parameter space is STILL very wide open… although both ATLAS & CMS have eaten some chunks out of it. 150 GeV sleptons, 300 GeV gluinos? Why not???? You think this is good, you should see the limits from the multi-jet, 0 lepton + MET search at ATLAS, shown for the first time today at Aspen! What if LHC will not find something relevant at all? I’m crossing my fingers (yes, a heretical act for an atheist) that SUSY will not be discovered at LHC and that instead, Nature will reveal secrets that exceed the farthest imaginations of the SUSY theorists (and by extension, the string theorists). I think too much of current theoretical physics is governed by the notion that mathematical elegance (“Super-Poincare algebras”), as extrapolated from the current framework of observable physical law, will pave the way to the Planck scale (equivalently, the notion is that mathematical analysis can tell us how QFT and gravity meet). In addition to being dismal (really, the long distance to the Planck scale is reachable without a new paradigm shift? ), such hubris deserves to be struck down by the gods, metaphorically speaking. As a mathematician I really have started to like supersymmetry (but then my real math friends just look at me like I’m crazy when I call everything with a Z2 grading super-something). Physically though? It’s been “just around the corner” for far too long. We’ll know soon enough I guess…. <iWhat if LHC will not find something relevant at all? Excellent question. Well, if it doesn’t then the Tevatron was the largest particle accelerator/collider we ever should have built, and in building a better one that DOESN’T teaches us anything new then THAT would be something, hmm? But I doubt it. Odds are the LHC WILL give us “New” Physics (it would be the first accelerator/collider that doesn’t if so), whether it’s Higgs or SUSY, or something heretofore completely unexpected to date, shrug, who knows? We’ll see. As a mathematician I really have started to like super-symmetry (but then my real math friends just look at me like I’m crazy when I call everything with a Z2 grading super-something). If Sean knows better sources, we’re all ears. Sometime you DO learn something by not finding things you might expect..as an exapmple, ee have learned A LOT from the lack of SUSY signals so far at the LHC. Of course we’d learn MORE by finding stuff. That would be a significant blow I would think. Notwithstanding the knowledge that negative results are still scientifically useful, the LHC cost one heck of a pile of money. It had better discover something in the affirmative or else watch the funding dry up. I hope that the LHC experiments lead to quantum jumps in physics, such as how electromagnetism and gravity are related, and maybe even faster than light flight. Even Atheists love what Pauli said about Fermions/Bosons: “What the lord god hath put asunder, no man shall ever join”. I steadfastly maintain that supersymmetry will go the way of the `Phlogiston’ & the Aether. Of course it’s all a shell game, & the SUSY adherents will just keep upping the mass-ante if it’s not seen at LHC or the Tevatron, but money is not likely to be forthcoming. 1.) The recently observed dark matter mass range, 7-10 Gev is too light to be explained by the `neutralino’, the SUSY candidate for DM. 2.) In 2008, a CDF/D0 Team nailed the switching rate of the B_s meson, in gross disagreement with the SUSY prediction. 3.) Recent LHC observations set a new bound on sparticles upwards of 600 Gev, when they were mostly predicted to lie around 200-300 Gev. If the LHC can’t find SUSY, she’s toast. And string theory w/out SUSY cannot stand, & the entire edifice collapses. At the risk of exposing the depth of my ignorance I’d like to say that I wish I had a better understanding of what is being explained but,alas,my math skills are SOOO badly lacking that it is embarrassing—-especially as I find quantum physics,theory and cosmology to be utterly fascinating and never get tired of “lurking” here to try and gain some understanding of the theories and postulates and arguments. While I will never, in all probability, be able to fully understand the concepts or the math my fascination for this subject is just as intense now as it was when I first started trying to make sense of it some 8 odd years ago. So thanks everybody for helping me to keep on wanting to learn more —— even if it is way over my head. This expresses a thoroughly unscientific attitude. In practice such sentiments can lead to the wish fulfillment error, e.g. seeing a magnetic monopole. I think it would be advisable to wait until a gluino mass in the range 1-2 TeV can be ruled out before jumping to any conclusions about whether or not supersymmetry has been excluded. At the moment, the limit is only about 700-800 GeV, so there’s a long way to go. If the LHC succeeds in eliminating (almost all forms of) supersymmetry, as it may be on it’s way to doing, that is huge. It really does tell us more about how the world works, or doesn’t. Wow. That being said, that there may not be some sort of operation that does O|boson>=|fermion>, and vice-versa, is almost more surprising. And on another note, who cares if supersymmetry doesn’t work in high energy physics? There are fun systems where it’s useful in condensed matter, so therefore it’s real, and physically useful, right? Doesn’t anyone get the impression that SuperSymmetry skips over some elementary stuff ? It seems to anticipate the Form of a theoretically desirable kind of solution where divergences can cancel in a nice way, and provide spacetime translations, etc. But why would Nature be so clever ? It seems to ignore the idea that Nature does the most with the least. I realise that as fields and particles are considered in QFT as manifestations of much the same thing, this may sound like a naive question or worse; but is it possible supersymmetry exists but at a deeper level in some sense than particles? If so, it might not necessarily be that each particle has a supersymmetric partner, but all particles have a mixture of complementary properties (which I won’t call “Bosonic” v “Fermionic”, as those terms refer to particles explicitly) related via supersymmetry, one of which predominates and gives the particle its Bosonic v Fermionic character. Or doesn’t it even make sense to frame the question of its existence in terms other than the two particle types? If you are thinking about going back to the drawing board, how far back would that be? The 1920’s perhaps, when an electron stopped being a rotating orbiting planet and became a point particle probability? Then you might have to give up all the jargon accumulated over 90 years! I take it you’ve not yet seen the (more imressive?) ATLAS 0-lepton results, part of which have been released in preliminary form at ASPEN last Thursday. Is there any consensus on what (s)particles will show up first, if there is SUSY? Is like the splitting of identical energylevels in molecular quantum chemistry, where one goes up as much (or a bit more) than the other goes down? That is to say, will the lightest SUSY ‘thingie’ be the twin of the heaviest normal stuff, which I guess in the top, or is it not as simple as that? Shot down in April, back up in May. Good questions. I think the gluinos and squarks have the best chance of being detected early, simply because they are coloured, and therefore should be produced relatively copiously in the LHC collisions. Other superpartners have to be produced via weak or electromagnetic interactions, and therefore require more data to be taken. In simple models of SUSY breaking, there are some rules about what happens to the masses, a bit like you suggest. However, ‘realistic’ models of SUSY breaking have a hidden sector which actually does the breaking, and this is then communicated to the standard model fields via ‘messengers’. Quite generically, the result is that the coloured superpartners tend to be heavier, with the sleptons, charginos and neutralinos lighter. This is roughly because gauge interactions drive the masses up, so stronger gauge interactions lead to larger masses. Thanks. I have to admit that I certainly don’t understand the details of that answer, but there’s plenty of fodder for googling now. I’m rather grateful that as a chemist I only have to deal with electrons. Subtext: string theorists get nervous? Probably way too soon to say that but maybe a twitch or two ? I must be in a dreadful mood as I’m picking on all of Sean’s posts tonight (sorry!). You say “One new thing we would like to see is supersymmetry.” Like? I think it is dangerous when we attach good/bad terms to finding or excluding a result or theory. The conclusion of the post is far better. Supersymmetry has been suggested independently in 1971 by Juri Gol’fand and Evgeni Likhtman, in 1973 by Dmitri Volkov and V. Akulov, and in 1974 by Julius Wess and Bruno Zumino. In 1976 Peter van Nieuwenhuizen, Sergio Ferrara, Daniel Z. Freedman, Stanley Deser, and Bruno Zumino suggested a local supersymmetry called supergravity. In 1981 Edward Witten has shown that supersymmetry can solve several shortcomings of Grand Unified theories. In 1984 Michael Green and John Schwarz have shown that string theory and supersymmetry can be combined. This is the superstring theory. In 1995 Edward Witten has shown that the membrane concept can agree the 11-dimensional supergravity with the 10-dimensional superstring theory. Both theories are limit cases of an 11-dimensional M-theory. Supersymmetric theories predicted that the elementary particles of the standard theory of particle physics (leptons, quarks, photon, gluons, W- and Z-boson, Higgs boson) have supersymmetric partners. This supersymmetric particles (called neutralinos, photino, gluinos, Winos, Zinos, squarks, and sleptons) were all predicted to have rest masses between 50 and 300 GeV (billion electron volts). Now the ATLAS Collaboration of the LHC (Large Hadron Collider) presented data (arXiv: 1102.2357) which do not confirm the gluino. It would have been detected if its rest mass were less than 700 GeV. I am not so surprised that signs of light supersymmetric particles have not been detected. I predict that supersymmetry will not be confirmed. My arguments are the following. (1) The main reason for supersymmetry is that it can explain some shortcomings of minimal Grand Unified Theories, i. e. the mass-hierarchy problem (i. e. the fact that W- and Z-boson do not have rest masses of 10^15 GeV, although they should have “eaten” (coupled to) the Higgs bosons of Grand Unification) and the non-observation of the proton decay (lower limit: mean proton lifetime of 10^33 years). But this argument requires that there is Grand Unification. Because of the U(1) x U'(1) group structure and the Dirac quantization condition e * g = h (unit electric charge times unit magnetic charge is equal to the Planck constant), this theory is hard to agree with Grand Unification. Although a group such as SU(5) x SU'(5) is in principle not impossible. (2) Another reason for supersymmetry is that it can explain the existence of (anti-symmetrical) fermions in an otherwise symmetrical theory (such as Special Relativity and General Relativity). However, it has long been known that a generalization of General Relativity which includes anti-symmetry is Einstein-Cartan theory. The affine connection of this theory includes not only the non-Lorentz invariant symmetrical Christoffel symbol but also the Lorentz invariant anti-symmetrical Torsion tensor. Within the framework of a quantum field theory, the Torsion tensor corresponds to a spin-three boson called tordion, which was introduced in 1976 by F. W. Hehl et al. : Reviews of Modern Physics 48 (1976) 393 – 416.